These huge bodied Vancouver Island Elk can tip the scales at 1000 lbs, with antlers that are well known for their massive circumferences, palmation and clustered crowning. They resemble the European red stag much more than the typical Rocky Mountain elk. 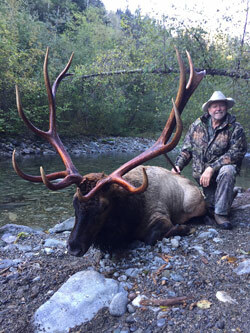 Vancouver Island, British Columbia, Canada consistently produces huge Boone and Crocket and Safari Club International bulls. The majority of the top 50 bull elk in the world have been harvested on Vancouver Island, BC, in recent years and records continue to be broken. Canadian Guides & Outfitters also hunts in a unique archery-only bow hunting area. This is an area where the elk herds have never been hunted by anything other than archery and crossbow. Hunting trips start with our archery season Sept. 10 in the heat of the rut when the bulls are the most vocal and come running to the slightest cow call, followed by our rifle hunt in October. Our experienced guides employ various hunting methods including much glassing, calling and spot/stalk using forestry roads and clear cuts as access to these elk herds. 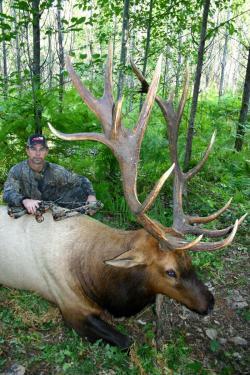 This is a ten day, 1x1 elk hunt based at a very comfortable, private lodge with excellent meals.